Meet Ann Lesch. She recycles just about anything she gets her hands on. And what she creates out of what most of us would consider junk is fabulous. Ann collects used plastic bags friends bring home from stores. 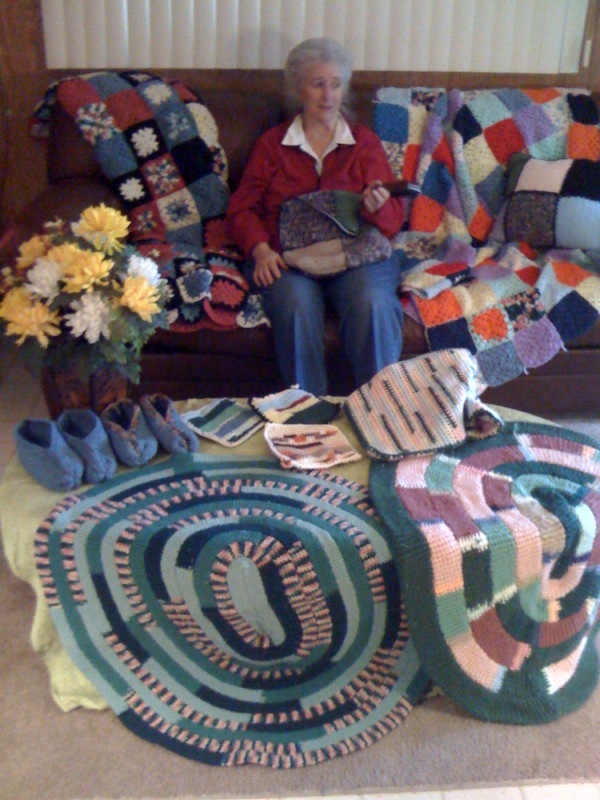 She washes them, sorts them by color, and cuts them into strips. Then she crochets them into these beautiful purses, book bags, beach bags, and mats for lying out at the beach. She also passes the mats out to homeless people to give them something to help keep them dry. Ann creates these treasures by covering boxes and containers with upholstery and drapery samples that she gets from interior decorating companies. Tons of these samples are tossed in the trash each season. 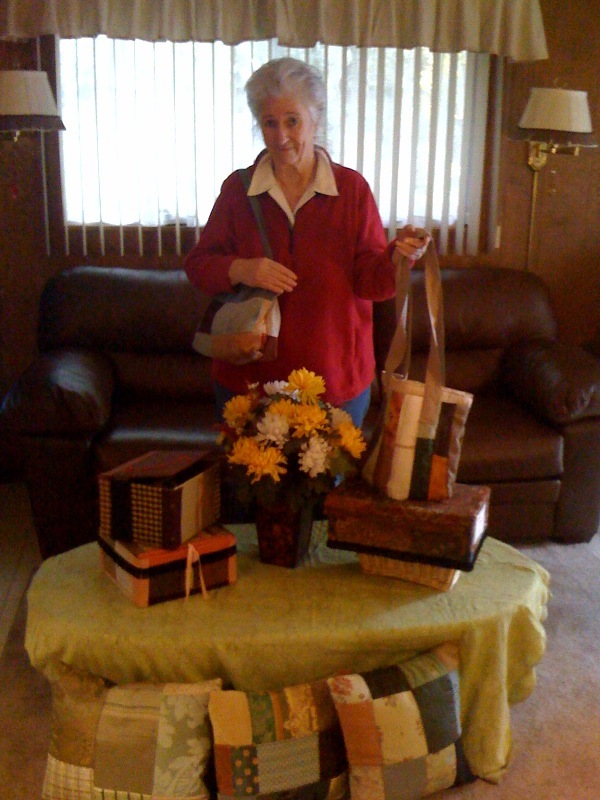 Ann turns them into purses, beach bags, pillows (which she tightly stuffs with recycled plastic bags), and lovely keepsake boxes. 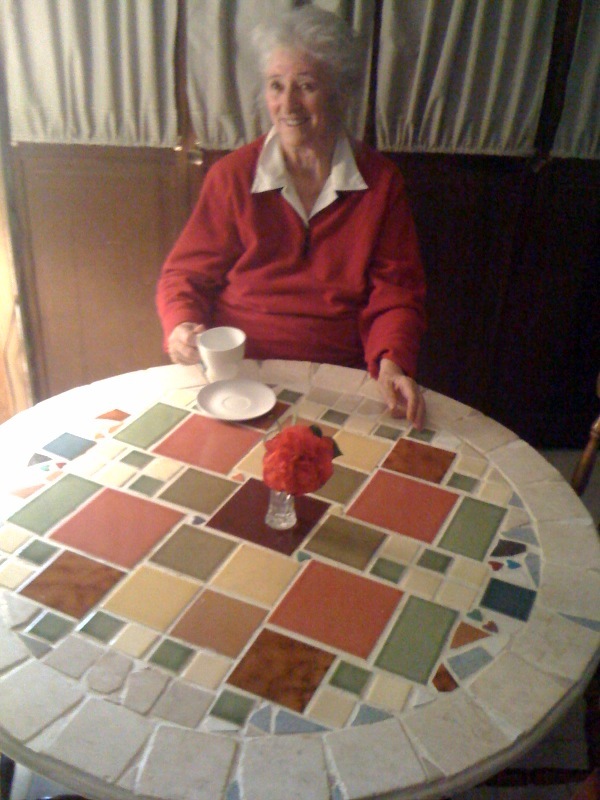 She collects outdated tiles from ceramic tile companies and covers old tables like this one. She also uses this technique for benches and chairs. If I had Ann's talent, I would have saved a lot of time searching for a tile table for our backyard. 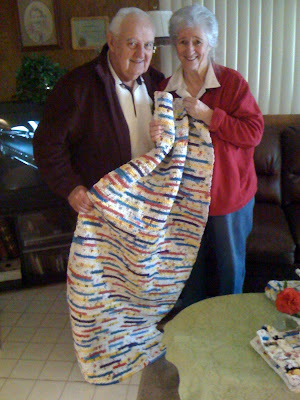 Ann's husband John clearly supports her talent and resourcefulness. 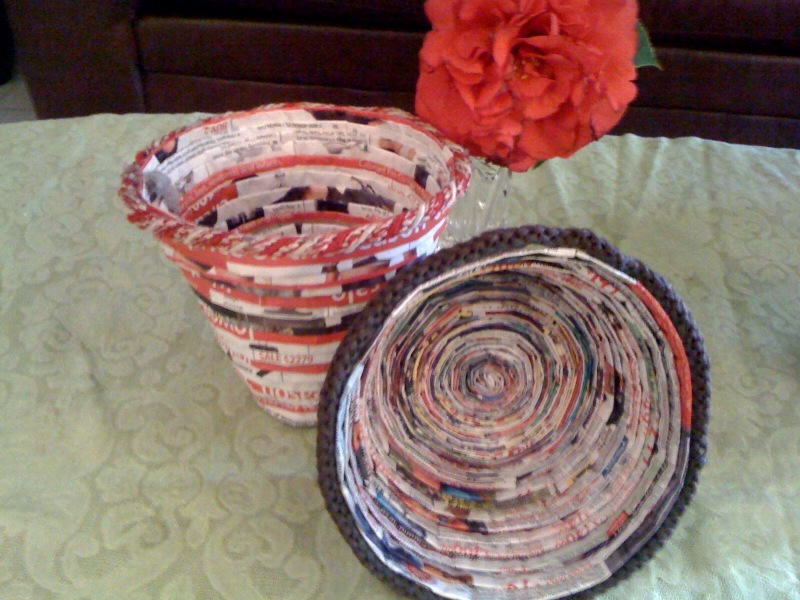 Believe it or not, these beautiful containers are made from magazine pages. Ann turns them into lovely flower pots, vases, and fruit bowls. And these creations were made with repurposed yarn from scraps and sweaters. What an inspiration! Talk about spinning gold from straw and turning trash into treasure. Ann's projects are the ultimate in recycling: an artist working with found materials. Ann's daughter Janice says she is so proud of her 80-year-old mother. She doesn't need a facelift to stay young. Her secret is appreciating the little things in life. Thank you Ann, for being an inspiration to all of us! Your talent is remarkable. Do you turn trash into treasure? Tell us about it in the Comments section. The plastic weaving and handing out to homeless and all. Dang, Ann - you are amazing! Wow! I love the mats, I would certainly buy one to do my stretching exercises at the office. And the ceraminc/tile table is absolutely gorgeous. Everything is so beautifully made and tasteful. Way to go Ann ! And thanks, Angela for posting this, it's so insperational. I absolutely love this story!!! Thanks for sharing the pictures with us! Ann is my new hero! My husband and I dabble at repurposing old furniture but she puts us to shame! 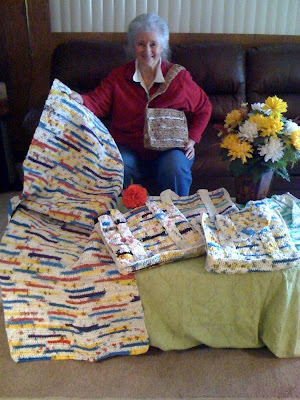 I love that she not only recycles, she makes items that are useful for other people. Mats for homeless people that are waterproof? Genius. I'm in awe! What an inspiration.